With tornado season fast approaching or already underway in vulnerable states throughout the U.S., new supercomputer simulations are giving meteorologists unprecedented insight into the structure of monstrous thunderstorms and tornadoes. 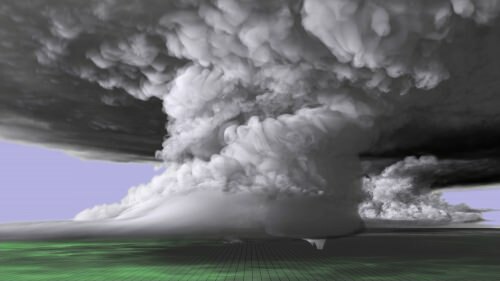 One such recent simulation recreates a tornado-producing supercell thunderstorm that left a path of destruction over the central Great Plains in 2011. The person behind that simulation is Leigh Orf, a scientist with the Cooperative Institute for Meteorological Satellite Studies (CIMSS) at the University of Wisconsin–Madison. He leads a group of researchers who use computer models to unveil the moving parts inside tornadoes and the supercells that produce them. The team has developed expertise creating in-depth visualizations of supercells and discerning how they form and ultimately spawn tornadoes. The work is particularly relevant because the U.S. leads the global tornado count with more than 1,200 touchdowns annually, according to the National Oceanic and Atmospheric Administration. In May 2011, several tornadoes touched down over the Oklahoma landscape in a short, four-day assemblage of storms. One after the other, supercells spawned funnel clouds that caused significant property damage and loss of life. On May 24, one tornado in particular – the “El Reno” – registered as an EF-5, the strongest tornado category on the Enhanced Fujita scale. It remained on the ground for nearly two hours and left a path of destruction 63-miles long. 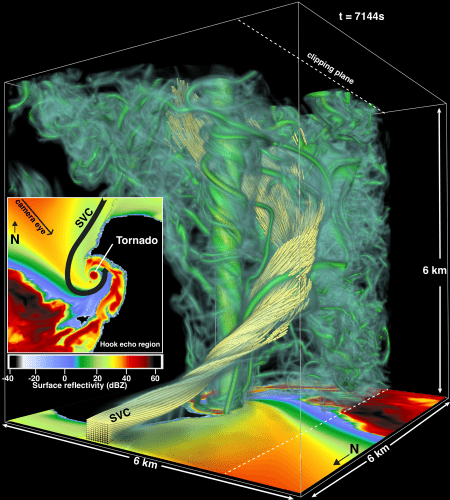 Orf’s most recent simulation recreates the El Reno tornado, revealing in high-resolution the numerous “mini-tornadoes” that form at the onset of the main tornado. As the funnel cloud develops, they begin to merge, adding strength to the tornado and intensifying wind speeds. Eventually, new structures form, including what Orf refers to as the streamwise vorticity current (SVC). Using real-world observational data, the research team was able to recreate the weather conditions present at the time of the storm and witness the steps leading up to the creation of the tornado. The archived data, taken from a short-term operational model forecast, was in the form of an atmospheric sounding, a vertical profile of temperature, air pressure, wind speed and moisture. When combined in the right way, these parameters can create the conditions suitable for tornado formation, known as tornadogenesis. According to Orf, producing a tornado requires a couple of “non-negotiable” parts, including abundant moisture, instability and wind shear in the atmosphere, and a trigger that moves the air upwards, like a temperature or moisture difference. However, the mere existence of these parts in combination does not mean that a tornado is inevitable. Orf explains that unlike a typical computer program, where code is written to deliver consistent results, modelling on this level of complexity has inherent variability, and in some ways he finds it encouraging since the real atmosphere exhibits this variability, too. Successful modeling can be limited by the quality of the input data and the processing power of computers. To achieve greater levels of accuracy in the models, retrieving data on the atmospheric conditions immediately prior to tornado formation is ideal, but it remains a difficult and potentially dangerous task. With the complexity of these storms, there can be subtle (and currently unknown) factors in the atmosphere that influence whether or not a supercell forms a tornado. In total, their EF-5 simulation took more than three days of run time. In contrast, it would take decades for a conventional desktop computer to complete this type of processing. Looking ahead, Orf is working on the next phase of this research and continues to share the group’s findings with scientists and meteorologists across the country. In January 2017, the group’s research was featured on the cover of the Bulletin of the American Meteorological Society. Orf’s work was supported by CIMSS/SSEC, the College of Science and Technology at Central Michigan University and the National Science Foundation (NSF). The research is part of the Blue Waters sustained-petascale computing project, funded by the NSF. A colorized image of the tornado-producing supercell nearly 20 miles long and 12 miles high. The imagery from the simulation was built upon real world data collected near the May 24, 2011 supercell, which spawned several tornadoes including the EF-5 that touched down near El Reno and Oklahoma City, Oklahoma. Orf’s collaborators on the simulation include: Robert Wilhelmson, University of Illinois Department of Atmospheric Science; Bruce Lee of High Impact Weather Research & Consulting, LLC; and Catherine Finley of St. Louis University. Lee and Finley are members of TWISTEX, the team that included Tim Samaras, who passed away in the May 31, 2013 El Reno Supercell.